A trade unionist was murdered in the department of Cauca yesterday, the latest killing in what has been one of Colombia’s most violent regions since the peace agreement was signed in November 2016. Dilio Corpus Guetio was a member of the FENSUAGRO trade union and worked coordinating peasant farming communities. He was shot dead at around 6am after leaving his home in the town of Suárez to go to work. Reports said a car pulled up and one of the passengers opened fire. As a community initiative, Dilio worked as a rural guard in the local area. These voluntary positions oversee security and organising for rural communities. Dilio is at least the second FENSUAGRO trade unionist murdered in 2019, following the killing of Wilmer Antonio Miranda on 4 January, also in Cauca. 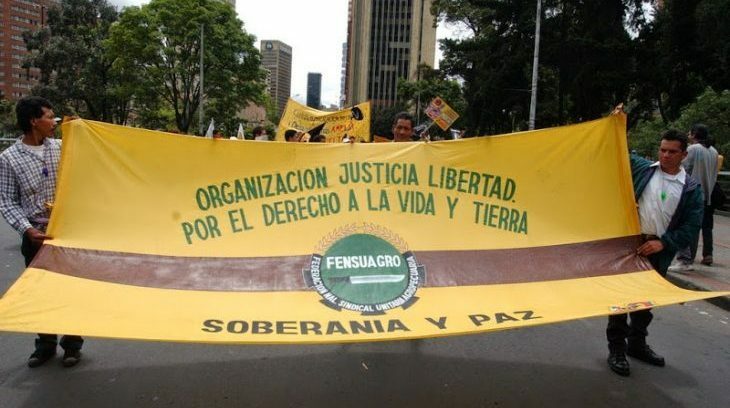 Several FENSUAGRO members have been targeted and murdered by paramilitaries and other armed groups. Colombia is still the most dangerous country in the world for trade unionists and human rights activists. Over 400 people were murdered between the signing of the peace agreement and the end of 2018, with around 20 people already murdered in 2019.